The 2nd derivative is diverging from the WLEI Diffusion, and as we mentioned, in the past when this has occurred, the Diffusion eventually is forced to play catch-up. This implies more structural damage could be ahead for the WLEI, that is not just limited to a deterioration in its levels. 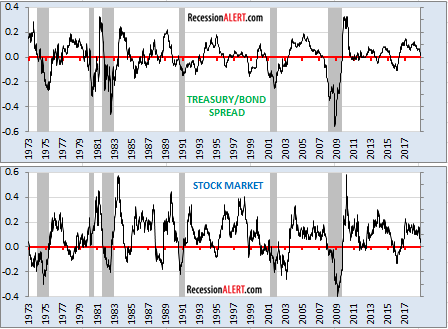 The components of the WLEI currently in recession are all related to the corporate bond market (AAA/BAA etc.) The Credit spreads market composite and the labour market composite are looking impervious at this stage. This leaves any further damage to the Diffusion likely to originate from the stock market or the Treasury/Corporate bond spreads composite. The ECRI WLI can lead the WLEI on many occasions, as it is composed of some longer leading and/or more sensitive indicators than the WLEI. When we constructed the WLEI our focus was less on longer leading characteristics and more on less “false positives”. 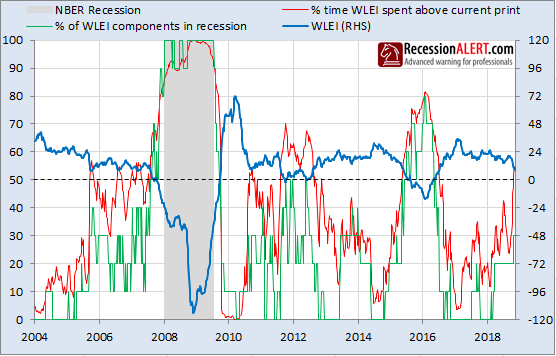 As you can see from the chart the WLI has had 4 false positives so far this business cycle versus 1 for the WLEI. 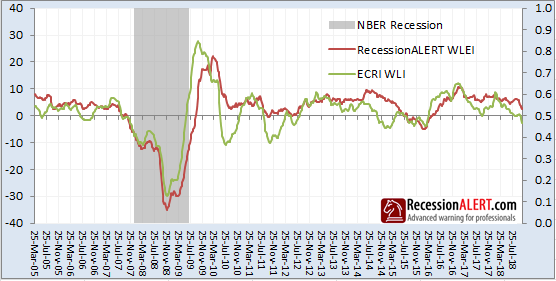 It’s a good pairing for high frequency leading data – you take the ECRI WLI as the 1st warning and the WLEI as second. If both are flagging recession, which looks increasingly likely in the next few weeks, you obviously need to take note and start consulting the more robust monthly models or the SuperIndex which is composed of many monthly models.